If you’re just tuning in, #GHC15 has come and gone and all I can start with is WOW! Yes, I put my figurative blogging pencil down for a few days during the conference and, yes, I did need a few weeks to recover from everything that was GHC. We said it would be the mother of all GHC conferences. Let’s just say it lived up to the hype and some. So where do we begin? I’ll start with my top seven reasons why GHC was simply the best thing since sliced bread. How do you fit so many amazing women in computer science into one room? 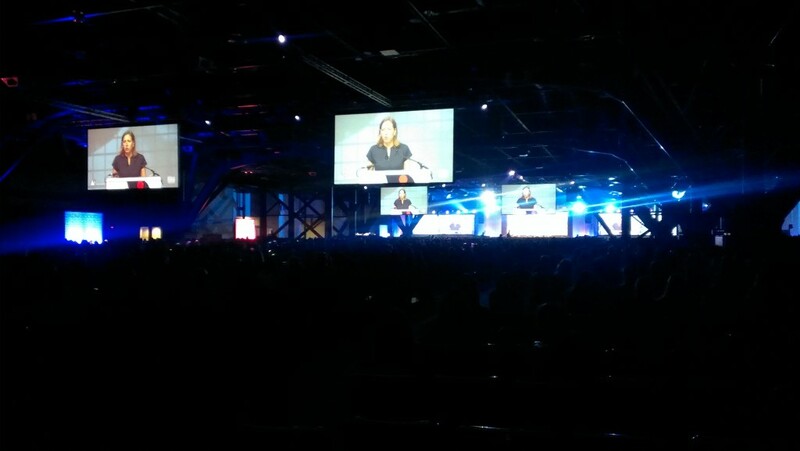 At final tally, #GHC 15 brought 13,000 attendees to the George R. Brown Convention Center. With speakers from Argonne National Labs to the White House, we weren’t in want of good panels to attend. Where do I put all this swag? To hear the marketing team at Burnett Specialists tell it, GHC’ers have seen some of the best swag out of conference-goers at GRBCC. So what was in the bag? I counted a Yelp’s 3-pronged charger (for iPhone, iPad and laptop), EOS lip moisturizer, handy Paypal sticky notes, Two Sigma’s mobile speakers, YouTube branded earphones and my favorite–the 158-page guide to every moment at GHC 15–to name a few items. When can I sleep? With every inch of our schedule packed with panels, posters at GHC, there really was no time to sleep. But as one GHC’er put it, “who needs sleep? Sleep when you get home!” That home was Houston didn’t seem to make a difference for me. I clocked 4-6 hours a night. You mean I’ll be hired on the spot? Yes! GHC is an action-oriented conference. So many employers came ready to recruit the next women transforming tech. And GHC made it easy for them, setting aside a large part of the exhibitor hall for employers to conduct interviews and hire employees on site. How do you turn down good advice? One of the surprising things about these #womentransformingtech is how willing they were to share hard-won advice with you at any point during the conference. I think the larger problem was turning down advice. Who does that anyway? Someone who is running from one panel to another and having to tear away from riveting conversation with the stellar woman in tech she just met. That’s who. How many projects can I possibly take on? The women at GHC know how to innovate. From launching projects to diversify STEM+C fields to transforming third-world education through software, GHC’ers were brimming with ideas about how to save the world or, at least, their communities. When can we GHC again? The conference is Oct. 19-21, 2016 next year. But the thing is you don’t even have to wait until next year to connect with GHC’ers and the Systers community. ABI.Local is the next step in building the local GHC experience. Communities have already launched in places like Silicon Valley, Chicago, Houston and Boston. And the good news is that each one of these communities will get to bring the spirit of GHC to the local communities through GHC/1 conferences. Are you ready for #GHC16?